Five years ago, while still enduring chemo treatments, I asked my friend Susan to join me in riding the PMC, the 192 mile bike-a-thon that raises millions of dollars for cancer research.. By asking her this, I was asking her to make a serous commitment in time and energy to train for this ride. Susan had no choice but to accept this challenge. After all, I was still practically bald. Three weeks ago we finished our 5th PMC ride. Each year we pedaled 1200-1500 miles from January to August to strengthen our legs and hearts, to build endurance and stamina in every kind of weather. Over time and miles, like every partnership in our lives, we fell unknowingly into certain roles. Susan became the “Sherpa”. Susan mapped out our ride-routes every week. She planned our training schedules and guilted me out of bed many mornings when I would rather roll over and pull the covers over my head. She plotted and planned every PMC weekend down to a fine point. Like any good type A business woman, Susan researched aspects of the PMC weekend and found out what was best to pack, what time we had to leave to insure that we make the bus ride, and even planned out the order of our pleasures as we approached Bourne and the end of our first day–shower, beer, massage. Each year she learned a new trick for saving time or making our journey easier for the next year. My role in the PMC equation became apparent early on as the “fundraiser”. My background in sales and marketing made me a far better candidate for this as Susan is not one to ask for money. It is this part of the PMC that makes Susan cringe. She hates it. But it doesn’t bother me as much because I know, having been the recipient of a drug found by research–a drug by the way that saved my life–that the whole point of the PMC is to raise awareness and money to continue the research that will save more lives. If the drug Herceptin was never funded and therefore never allowed on the market, I wouldn’t be here today to be writing this. So fundraising? I say ‘bring it on’. Because everyone –I mean everyone–has been touched by cancer. It’s not even a possibility anymore. It is just a fact. So in the past years I was getting creative with the fundraising. I used social media, I had Silpada parties and I began making Wash-R-Ware necklaces which in the first year profited $6000 dollars for our ride. In the past I was able to raise my money and a good portion of Susan’s to guarantee that neither one of us was left to pay the balance. You see we each have to raise $4300 by October 1st or it comes out of the charge card we put down as collateral. Some people gasp at this amount.A lot of money? Yes, I think it’s a lot of money. But there is a goal every year and there are only so many riders. So the total needs to be divided among us. There has to be a cap of riders -there isn’t enough room on the roads–even now it’s a very crowded ride. Crowded with riders who are there for the challenge–there for the cause. The thing is this. 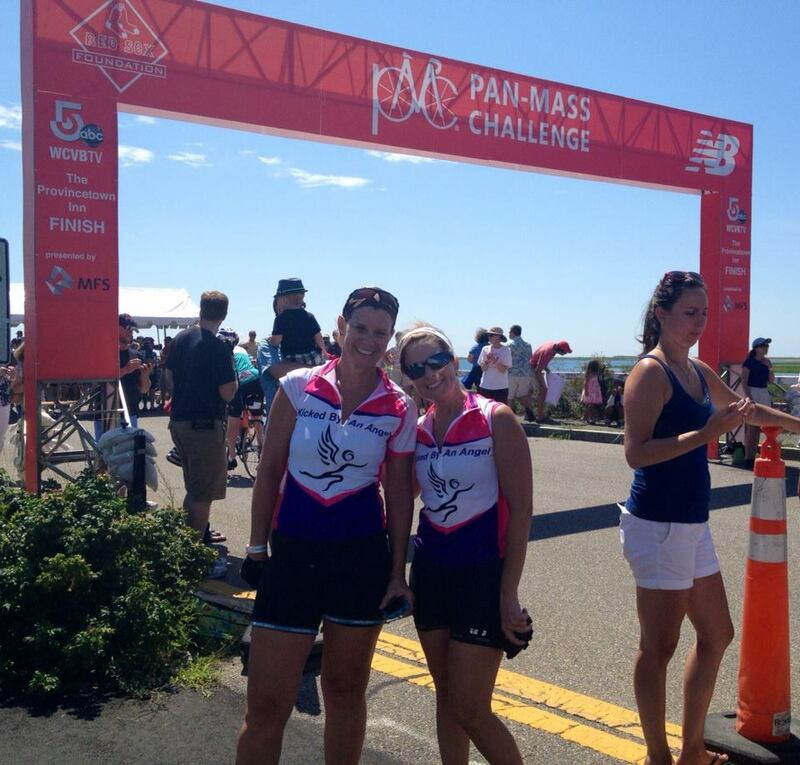 If Susan doesn’t reach her goal–this is the end of our PMC line. She won’t do the PMC anymore. Without my Sherpa, I don’t think I can do the ride alone. At first when she told me that this was the last year, I thought “ok, that’s cool, we have done this enough”…but as I sit here looking at photos of the weekend–the riders and the volunteers, the survivors and the pictures of the deceased–I am getting heartbroken over the thought of not training and riding next year. How can I remove myself from one of the greatest cancer fundraisers that exists when I still have my health–when I am alive because of the PMC. So if you are out there and you wanted to donate this year but forgot or thought it was too late, take heart. There is still time. Here is the link to Susan’s page. It doesn’t have to be a lot. Every little bit helps. And if we can help her reach her goal–then maybe, just maybe, she will agree to ride again next year. This entry was posted in Uncategorized and tagged PMC. Bookmark the permalink. You ladies shouldn’t stop now!! Go for 10yrs!